I’m not sure about this identification, but these are such neat fungi that I just had to post them. These are cup fungi, or Ascomycetes. This one forms such a perfect cup that it holds water. I found this group in May at Mountain Lake in Giles County, VA. As you can see, they were growing on a dead stick of wood. If you look closely at some of the photos, you can see how spores rise up in little smoky clouds when the wind blows. How neat is that! And about the name Devil’s Urn…I’m not certain what that’s all about, but it sure sounds intriguing! “The Devil’s Urn is frequently encountered by morel hunters in the spring, east of the Rocky Mountains. It can be found growing singly or in small clusters, on sticks and small logs–though the wood is often buried so they appear terrestrial. 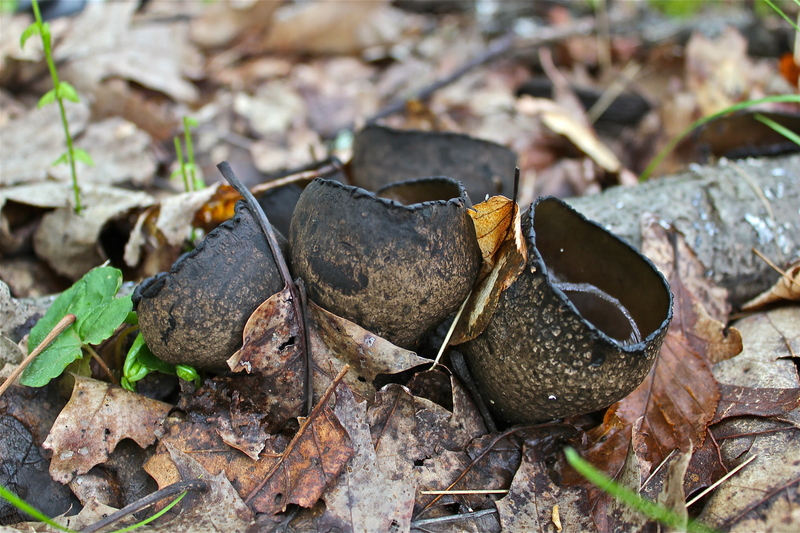 Urnula crateriumtypically begins to fruit before the black morels, and continues coming up well into morel season. In fact, many morel hunters judge the season’s progress on the basis of this odd little mushroom’s presence or absence. Ecology: Saprobic on sticks and small logs (often buried) of hardwoods; growing alone, scattered, or in dense clusters; spring; widely distributed east of the Rocky Mountains. Really cool looking. So different.